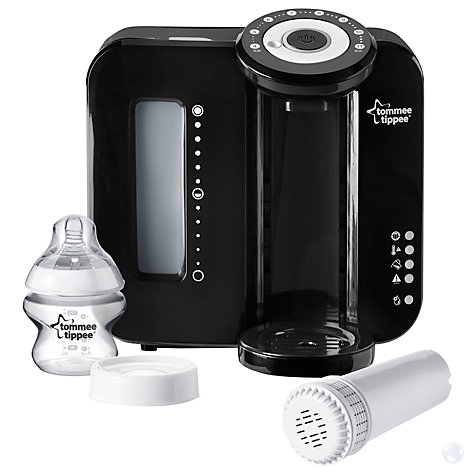 So you're considering buying the Tommee Tippee Perfect Prep Machine? Good for you. 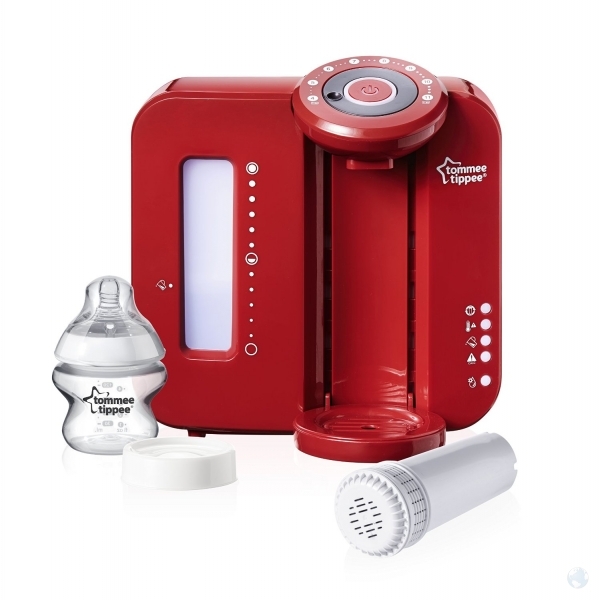 This is one of the smartest gadgets to reach the market in recent years, providing thousands of parents with a stress-free way to prepare their little ones formula milk. This new counter-top kitchen robot is available in white for around £80, and also in red and black but most retailers charge more for these colours (we don't know why!). Simply place a clean empty milk bottle under the machine spout, set the dial for the quantity of water needed and press the large button. Hot water is poured into the bottle. Then insert the required amount of milk powder, attach the lid to the milk bottle and shake well until all powder is dissolved. Remove the lid and replace under the machine spout. Cool water is poured into the bottle. Again attach the lid to the bottle and shake well. - Yes a bottle can be prepared in under two minutes. - The Perfect Prep provides reassurance to parents (and their families, childminders, etc) that milk is prepared to the right temperature. - When used correctly, the formula milk is sterilised with the hot water killing any bacteria that has been building up in the powder. - There is no need to purchase a bottle warmer. - It is easy to clean with a cloth on the outside and the instruction manual gives details on how to set the machine to conduct a detailed clean. - The machine can be used with almost any bottle types and powder formula milk brands. - The Perfect Prep is a good size and not too big. - The price is one of the cheapest on the market. - The Perfect Prep gives a loud-ish beep when the bottle is ready. This can be rather annoying when you're trying to make a bottle at 4am and trying not to wake the whole house. - This machine does require a little bit of work from the user and so it is not made fully automatically. - The minimum sized portion that the Perfect Prep makes is 4 fl oz. A very young baby (newborn) is unlikely to drink that amount and so some milk will be wasted during your little ones' early days. 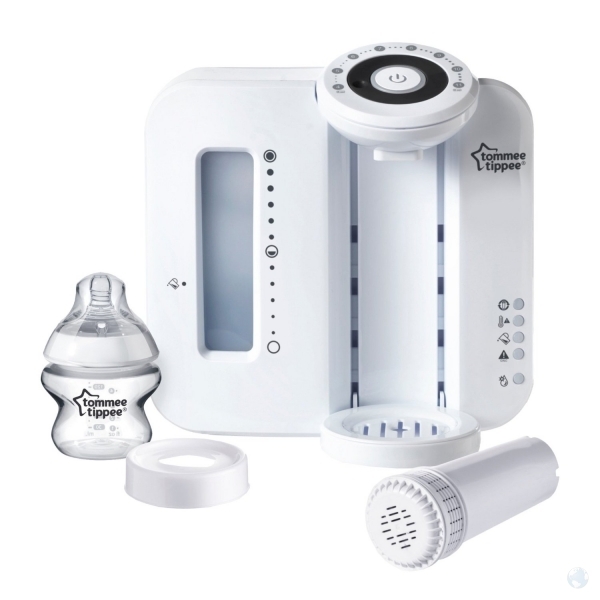 This is a fab machine and well worth the money if you're planning on giving your baby formula milk. Yes the user has to place the milk powder into an empty bottle and then shake is half way through, but that's really all the work that's involved in preparing each bottle. This is a great time saving considering that you may end up making well over 1,000 bottles in your little ones first year. Even if this machine is intended for use after you have finished breastfeeding, it's still well worth the purchase. Take a look at our stockists here and you'll be able to see who has the best deal. Tip - You will have to change the water fiilter in the Perfect Prep every few months. The machine will display a light when this needs doing. You can purchase a filter from any of the machine stockists. If they are sold out, Toys R Us usually always still has these in stock.